NASA’s New Horizons spacecraft took one giant leap for man, successfully traveling to the edge of the solar system, and it’s made some interesting discoveries out there. 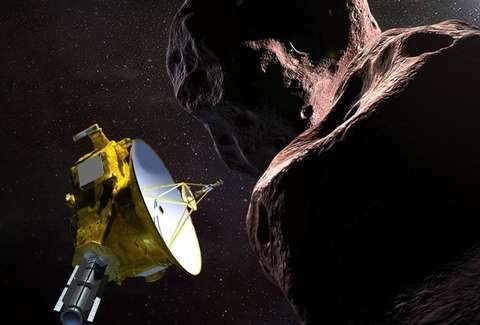 The space agency shared the first photos from the mission, showing off something called Ultima Thule (a controversial name, to say the least) -- a trans-Neptunian object located in the Kuiper Belt that looks a bit like an unfinished red snowman. The close-up snapshot was taken by the probe as it sped past at 12:01am on New Year’s Day in a donut-shaped ring of tiny planets, boulders, and other debris billions of miles from Earth and 1 billion miles from Pluto left over after the solar system was formed more than 4.6 billion years ago. The crimson object -- formerly known as 2014 MU69 -- measures 21 miles long, 10 miles wide, and spins on its axis once every 15 hours. NASA snagged the photo, and thousands of others, from a distance of about 18,000 miles. Although the probe was quite a distance from the actual object, it’s the furthest humanity has ever explored in space. “Meet Ultima Thule,” Alan Stern, the mission’s principal investigator, said as he showed off images of the space snowperson. Scientists originally described MU69 as being shaped like a bowling pin. They have, however, rightfully changed their mind. “That bowling pin is gone. It’s a snowman if anything at all,” Stern said. Scientists referred to MU69 as a bi-lobate comet. They claim it’s never traveled anywhere near the sun. Before you start theorizing about what space creatures built this snowman-like object, allow us to explain Ultima Thule’s unusual shape. The reason the two rock-like formations appear to be stacked on top of one another is, according to science, likely because of swirling ice and dust particles. “If you had a collision with another car at those speeds, you might not even fill out the insurance forms,” he joked. Early analysis of the photos shows a neck connecting the two rocks, which appears brighter than the two round parts. This, according to scientist Cathy Olkin, is probably because a bunch of loose grains of space dust have started collecting there. As for the snowman’s dark red hue, well, that’s all thanks to space radiation and exotic ices on the surface of the lobes. Scientists are far from done studying Ultima Thule. NASA is hopeful that this lengthy mission will provide insights into the conditions in space when the solar system formed. Objects in the Kuiper Belt are believed to have been hanging around since the earliest days of space as we know it, and they may even look the same. In the next 20 months, New Horizons hopes to send back more interesting data about what’s going on all the way out there at the edge of our solar system. In the meantime, they’re working on getting higher resolution images of their most recent discovery.